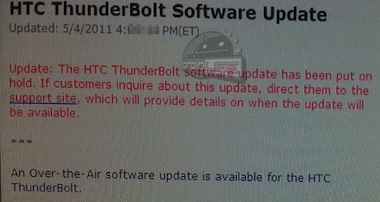 Remember that HTC Thunderbolt update that was supposed to begin rolling out yesterday? Well that may not be happening as an internal memo from Verizon hits the web. The memo explains that the software update for the Thunderbolt has been put on hold without giving a reason. The company is telling its employees to point customers in the direction of the support site to stay up to date with when the update will be available.